Park Jiha first gained attention with her duo project, [su:m], exploring traditional Korean sounds from a modern urban perspective. 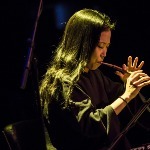 Now with her new, enlarged ensemble she adopts an even more cosmopolitan approach, where her intuitively beautiful compositions and lyrical playing on the traditional Korean instruments, the piri (double-reed bamboo flute), saenghwang (mouth-blown pipe organ) and yanggeum (hammered dulcimer), are brought into fluid dialogue with vibraphone, saxophone, bass clarinet and double bass. 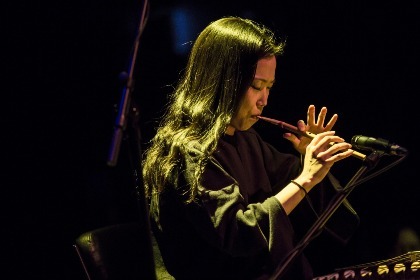 The result is a cross-border contemporary classical chamber jazz with deep Korean roots, offering an entrancing journey through moments of calm reflection, evolving into pulsing ambient textures and urgent improvisatory passages that crescendo and then resolve back into space. Park Jiha’s album, Communion, was nominated for two Korean Music Awards this year, establishing her as one of Korea’s leading international music artists.